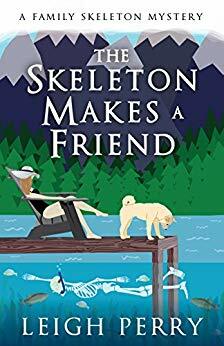 I’m pleased to have author Leigh Perrry who also writes as Toni L.P. Kelner from Malden, Massachusettes here to speak about her writing and new release, The Skeleton Makes a Friend that’s on blog tour with Escape with Dollycas into a Good Book. How long have you been published? What titles and/or series have you published and with which publisher? Have you self-published any titles? Please give details. Are you trying to make me feel old? My first book came out just over 25 years ago! 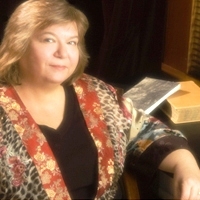 I had eight books of the Laura Fleming series with Kensington. (Though two were under the Zebra imprint.) The three books of the “Where are they now?” series came out from Berkley Prime Crime. The anthologies I co-edited with Charlaine Harris came out from Ace. (Though one came out from Audible first.) The first three books of the Family Skeleton series were published by Berkley Prime Crime, and the most recent two are coming from Diversion. And I published one collection of the Laura Fleming series under the auspices of JABberwocky, my literary agency. That’s not counting short stories—if we throw those into the mix, it’ll be far too confusing. Wow! that’s quite a publishing history. I’m impressed. Tell us a little bit about your books — if you write a series, any upcoming releases or your current work-in-progress. If you have an upcoming release, please specify the release date. These days I’m writing the Family Skeleton mysteries for Diversion Books, and the fifth—The Skeleton Makes a Friend—came out November 6. The elevator pitch for the series is this: Adjunct English professor Georgia Thackery moves her teenaged daughter back to her family’s home, and has to confront the family skeleton. Which is a skeleton. Named Sid. He walks, he talks, he makes bad bone jokes. Together, he and Georgia solve crimes! That’s the big question, isn’t it? I’d like to hit the New York Times Best Seller List (extended list would be fine), get a movie or TV show option, and receive an Edgar nomination. And all I can do for all three is to write the best books and stories I can. Well, good luck with those excellent goals. I hope you achieve them. Generally, I think I appeal to the cozy reader. But these books also appeal to a handful of young people who are usually science fiction and fantasy readers. That’s a good mix for a readership. Don’t give up, and don’t be afraid to try new things. I started out trying to write science fiction, and honestly wasn’t very good at it. When I switched to mystery, I did much better, but it still took a lot of query letters, rewriting, and more query letters before I got a contract. It’s even harder in today’s publishing world. I’m trying to find an agent myself, although I’ve been publishing my series with a a very good online publisher. I don’t know that I had it any harder than anybody else. It might have been a little more difficult getting interest in a Southern series back then, but Margaret Maron, Carolyn G. Hart, Sharyn McCrumb, and Joan Hess were doing just fine. In some ways it’s harder now because there are fewer big traditional publishers. Very true. As a librarian, I recognize those authors and have enjoyed their books. I’m in some writer’s organizations (Sisters in Crime, Mystery Writers of America, American Crime Writers League, Shore Mystery Fiction Society), but no writing workshop kinds of groups. Those are good organizations. I belong to Sisters in Crime and also their guppies group. Reading and playing on the computer. Those are my hobbies, too, although I also like to exercise to video DVD’s to get away from the computer and play with my cat and new kittens. I hate the waiting. Waiting for a contract, waiting for an edit, waiting for reviews, waiting for sales figures. It’s a powerless feeling, and I despise it. My personal challenge is belief in myself, even after all these books. I think those challenges are pretty common for most authors. I don’t think I set out to write cozies—I just set out to write the world I know, and my world is pretty cozy. That being said, there’s still plenty of meanness, anger, fear, vengeance, and of course murder to keep my mysteries moving. I relate to that because I didn’t set out to write my cozy series either. I thought the first book was a romantic suspense standalone novel, but readers thought differently, and so the Cobble Cove cozy mystery series was born. Despite his assurance, it seemed to take an awful long time to get the door open. Or maybe it just seemed like a long time because I kept looking down the stairs, worried that somebody would hear us and come to see what was going on. Finally there was a loud click, and Sid said, “Nailed it!” He opened the door, and cold air streamed out. I followed him into the human resources department, pulling the empty suitcase along. There were four more closed doors: three offices labeled with names and one marked File Room. “Here we go,” Sid said, using his picks on one of the office doors. “Got it.” He stepped inside. Then I looked at him. “Did he see you?” I said stupidly. He slowly shook his skull, and only then did I realize what it was we’d been smelling. Just that the Family Skeleton is not a metaphorical skeleton. Sid is a real live… Okay, not live, but a real living skeleton. So many mysteries use skeletons and skulls on their covers, and I don’t want anybody getting upset when Sid shows up on the page. Thanks for clearing that up for those who may have misunderstood. Georgia Thackery is feeling pretty good about her summer job teaching at prestigious Overfeld College, and she’s renting a rustic cabin right by a lake for herself, her daughter, Madison, and her best friend, Sid the Skeleton. Together again, the trio are enjoying the quiet when a teenager named Jen shows up looking for her friend. Georgia doesn’t recognize the name, but she learns that the person Jen was looking for is actually Sid. Sid reveals that he and Jen are part of a regular online gaming group that formed locally, and one of their members has gone missing. Sid admits that he might have bragged about his investigative prowess, enough so that Jen wants him to find their missing player. Given that Sid doesn’t have many friends offline—none, really, unless you count the Thackery family—Georgia agrees to help him search. They manage to discreetly enlist Jen, who lives in town, and follow the clues to… a dead buddy. Now they’ve got a killer on their hands. Probing the life of Sid’s friend, they realize a lot is wrong both on campus and in the seemingly quaint town, and someone doesn’t want them looking deeper. Thank you for the wonderful interview with Leigh Perry and the information on “The Skeleton Makes a Friend”. Appreciate your being part of the book tour. I have this great sounding book on my TBR list and can’t wait for the opportunity to read it. So glad you enjoyed the interview, Kay, and thanks for adding the book to your TBR list.